Signing off and toasting: To more awesome (and researched) credible health content for the internet! Originally published June 2017; updated with even more awesomeness August 2018. Even if you don’t love or have time to research your health blog posts (or vlogs, podcasts, infographics, etc.) – you probably should. Do you want more confidence putting yourself out there? Do you want your readers to trust that what you’re saying is backed by more than just an opinion? Do you want to differentiate yourself from the rest of the huge and growing wellness industry? If you said “yes”, then read on for three more strategic biz-building reasons why you should research health blog posts; PLUS a super-special time-limited offer for my course that will help you find credible health research really quickly! By doing research you will be seen as an expert thought leader and it can even open up doors for networking in the industry! As a wellness professional, you want to help your clients improve their health. You want them to feel better. You want them to get results. Another reason researching is best for your clients is that you may find out something new. Maybe new research shows an even better course of action? Or maybe there is a “contraindication” with a supplement you were going to recommend (a reason they should NOT use that supplement). For example, I did a bit of research and found that grapefruit (and its juice) interacts with dozens of medications(1). If your client is taking one of those meds, you should not recommend grapefruit to them. What about people who are not your paying clients? What about people who read your blog, watch your videos, listen to your podcast, or go to your talks? Having research behind your statements helps your audience trust you because YOU are the expert. They will see that you stand out from the majority of wellness professionals because YOU bothered to do research and YOUR information is reliable. It also lets them look further into the topic and check out your research sources for themselves if they want to. In return for referencing trustworthy information and websites they trust you even more. When they trust you more, you have more credibility and influence. I know I’m not the only person who looks at references when I need to know new health information! 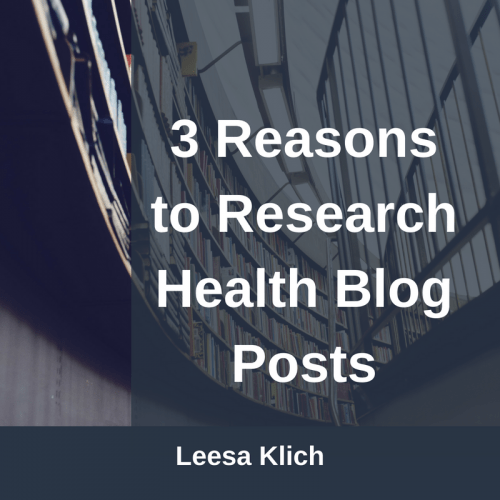 BONUS REASON TO RESEARCH HEALTH BLOG POSTS: If you come across a new or unknown remedy or contraindications, sharing that with your audience can set you apart as a thought leader. Staying on top of the news in your niche is a great way to increase your credibility and influence. An oft-neglected benefit to linking to your research sites is that it gives you an opportunity to network with them. Some websites publish “backlinks” or “trackbacks” in the comments section of their blog articles (mine does!). Even if they don’t publish their backlinks, they may notice some traffic being referred from your site. Even if your favourite credible influencer doesn’t notice your backlink, you can use your post to open up a conversation with them. You may want to connect to get on their radar, or even offer to help them or work with them in some way. Hint – don’t reach out to them the wrong way! Linda Dessau from Content Mastery Guide has a great article on how to show influencers in your field some “link love” by telling them that you’ve mentioned them in your blog. And just in case you’re concerned that you’re sending people away from your site with your outbound links, don’t worry! Just ensure that your link opens up in a new tab. This way, when they close down that tab, your blog post is still front and centre! Researching doesn’t have to feel tedious or take forever, though! Here’s how to do research efficiently. And if you want a bit more guidance on how to research health topics online, feel free to check out my course How to do health research online. 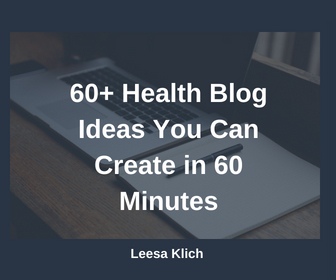 Do you regularly research your health blog posts? If so, did I miss a benefit that you’ve seen? If you don’t research and link to your references, why not? Is there something you could use some help with? Do you have any questions or concerns about researching health information? Let me know in the comments and I’ll personally reply!